Mumbai, Oct 7 (IANS) Around 54,000 petrol pumps all over India will go on a 24-hour strike from midnight on October 13 demanding inclusion of petroleum products under GST and other long pending issues, an official of a petrol dealers association said here on Saturday. 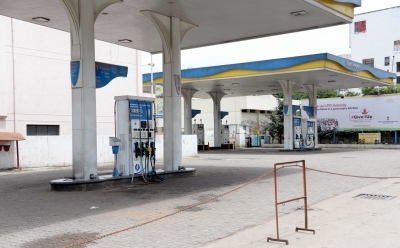 “All the petroleum products must be brought under the Goods & Services Tax regime so that our long-pending demand of ‘one nation, one rate’ can be fulfilled to benefit the consumers,” said Federation of All Maharashtra Petrol Dealers Association (Fampeda) President Uday Lodh. According to Lodh, even the proposed ‘Home Delivery’ of petroleum products is riddled with major security issues, could lead to serious accidents and hence must be reconsidered. Lodh said that a decision on the strike was taken at the first joint meeting of United Petroleum Front (UPF), an umbrella organization of three nationwide organisations of all petrol dealers – Federation of All India Petroleum Traders, All India Petroleum Dealers Association and Consortium of Indian Petroleum Dealers – held here on Saturday. “As the first step, we shall stop buying and selling petrol/diesel at all the 54,000 pumps in the country on October 13. If our demands are not accepted, then from October 27, we shall launch an indefinite nationwide strike till all the trade anomalies are resolved,” Lodh said. Meanwhile, a petrol dealer said that the decision to combine the three top dealers’ association under an umbrella organisation would result in better coordination and uniform action to fight for their common demands with the OMCs.